The lower South Island once again felt the tremors from a large earthquake off the coast of Fiordland in the vicinity of George Sound. The magnitude 6.7 quake struck at 1:29 am on Tuesday 16 October. 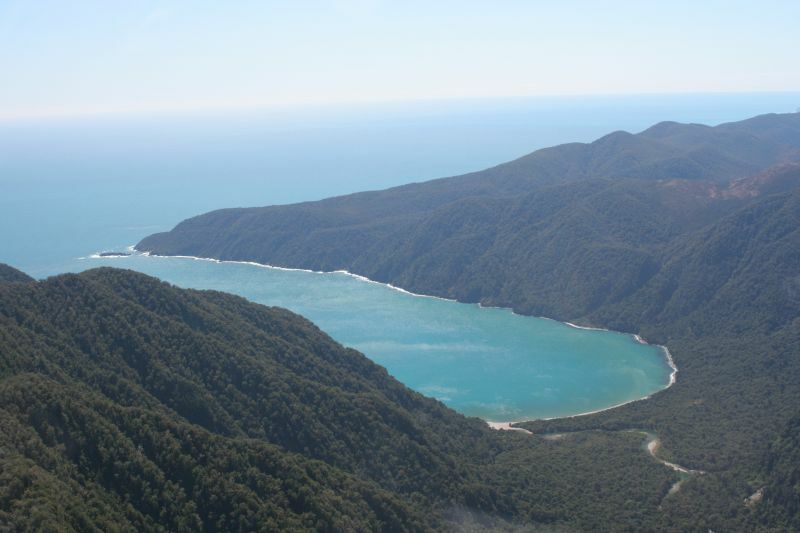 On Tuesday, 16 October 2007, the lower South Island once again felt the tremors of a large earthquake off the coast of Fiordland, in the vicinity of George Sound. The magnitude 6.7 quake struck at 1:29 am, and was felt widely from Stewart Island to Wellington. The shaking caused landslides in the steep slopes of Milford Sound, while in the nearby Hollyford Valley objects were thrown to the floor, including a heavy VHF radio that fell from its position atop a television set. The earthquake also caused minor contents damage in the town of Te Anau, where stock fell from shelves. The earthquake was followed by a rich sequence of aftershocks, the largest of which was magnitude 6.2 and struck 9 hours later, damaging goods in Queenstown, Frankton, and Cromwell. 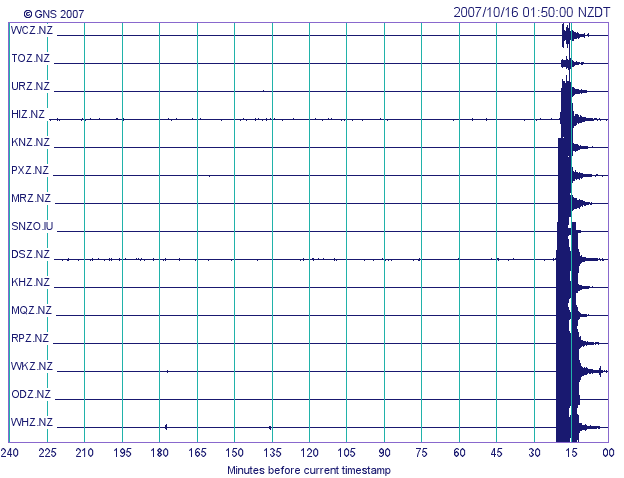 National network traces soon after the magnitude 6.7 earthquake. 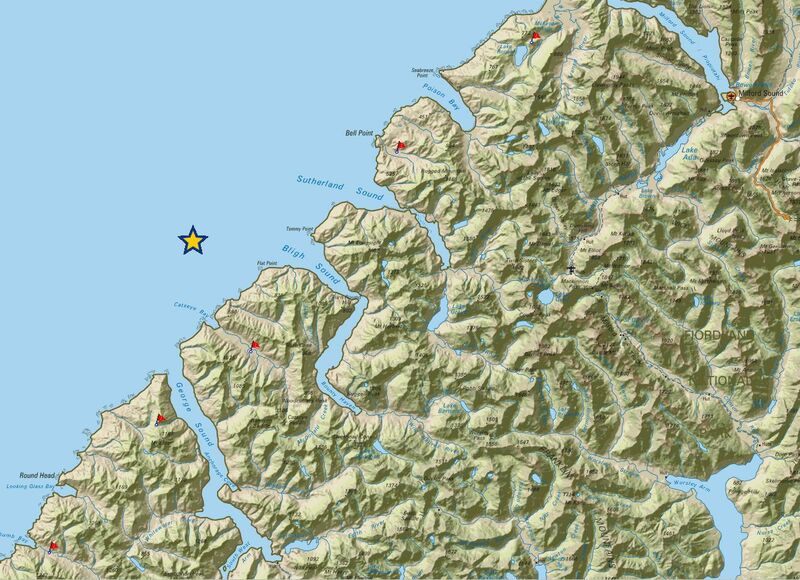 Magnitude 6.7 earthquake at 1:29 am: We received reports of landsliding in the Milford Sound area. One respondent in the Hollyford Valley reports their heavy VHF radio being thrown off the top of their TV, and stock in the shop falling from shelves. There were no reports of any structural damage. There were other reports of minor contents damage such as objects falling from shelves, also from the Milford Sound and Te Anau areas. Magnitude 6.2 earthquake at 10:28 am: Reports of goods falling from shelves at a Queenstown supermarket and in nearby Frankton. A report from Cromwell reported many things falling from shelves there. GNS Science sent three staff to the area to deploy 6 portable seismographs at 5 locations. They installed the instruments on Thursday 18 October, reoccupying some of the sites used in monitoring 1993 aftershocks; the sites are shown on the accompanying map. Data recorded by these instruments enable scientists to locate aftershocks more accurately and better understand which part of the crust has ruptured, and how it might affect nearby faults. The earthquake was recorded on all instruments of GeoNet's 100-strong seismograph network, and on nearly 30 strong-motion recorders designed to capture data from the strongest of shakes. 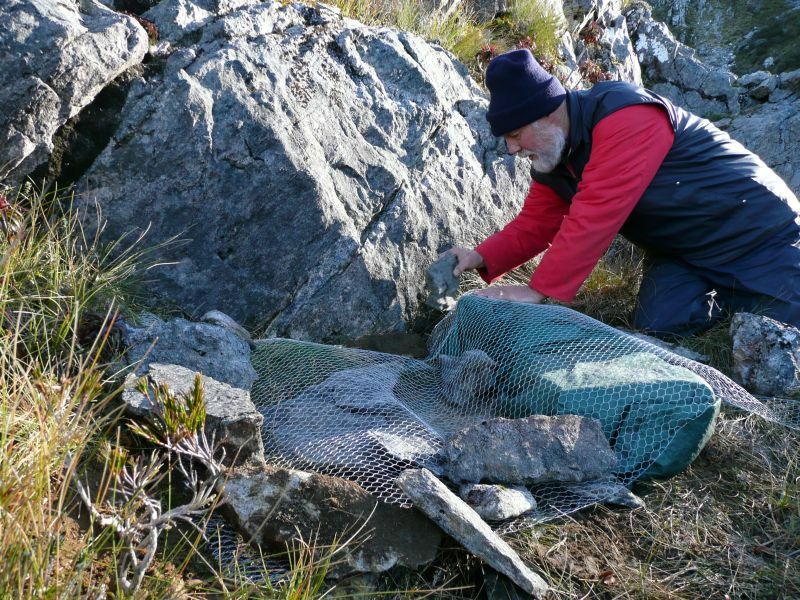 Kea-proofing the seismograph near Mt Tanilba, the southern-most emporary instrument." Poison Bay, Fiordland. A temporary instrument was deployed southof here at Rugged Mountain." Map showing portable seismograph installation sites. 1Since revised from the initial estimate of 7.1. Note also that there were two aftershocks greater than magnitude 6 in this sequence. 2One aftershock greater than magnitude 6 in this sequence. What's going on in Fiordland? 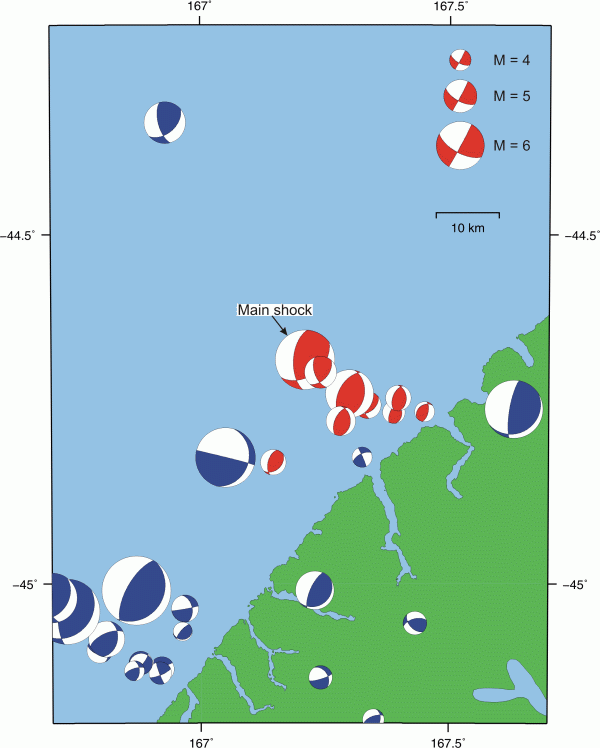 Map showing mechanisms for Fiordland earthquakes. The fault plane solutions are scaled according to magnitude as shown in the legend, with the main shock having a moment magnitude (Mw) of 6.7. Moment magnitude is derived from the seismic moment which is a direct measure of the physical size of an earthquake. Moment magnitude is considered to be the best magnitude estimate for earthquakes but is more difficult to calculate than other types of magnitudes. Fault plane solutions for past earthquakes (shown in blue) are quite varied and show that the tectonics of the region are quite complex. However, the largest earthquakes have been primarily reverse faulting mechanisms with the exception of one normal faulting mechanism.